and said she had something to bring me. Depression Glass tea trivet from the trash pile of an estate. She "knew" I would appreciate it. Thanks Cindy! I love it! What a nice addition to your collection! How gorgeous and what a thoughtful friend! But who would put that in the trash? I've never seen one of those but I would love to find one. Enjoy! 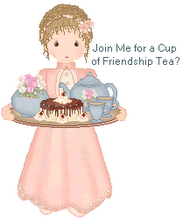 It's a lovely teapot trivet, Linda, and Cindy is a nice friend! What a thoughtful friend. It looks like it could be depression glass. I have not seen anything like it. Thanks for sharing. Very nice, and a thoughtful friend. Well, my goodness, I don't believe I've ever even seen or read about a Depression Glass trivet! Love it!